When I was pregnant with the girls, I printed out the lyrics to the song "I Hope You Dance" by Lee Ann Womack and posted them near my desk at work. Since my girls' birth, I want to cry every time I read the lyrics, or hear that song on the radio. I had hope for the child that I did not yet know when I was pregnant. Now my hope for them is even deeper and more intense..both literally and figuratively. I hope they dance. Holland and Eden's first dance class meant a lot to me on many levels. More than I even knew. I had kind of put it off...thought it wasn't a real possibility and did not feel up for another fight. I was sure I did not have the reserve for rejection in any form, and for that reason I decided not to pick this particular battle. I was afraid. Afraid of what I might face in asking if the girls could join a "normal" dance class. Afraid of the negative or fearful attitudes of parents and teachers that I might come up against. Afraid that having them in a dance class might make people uncomfortable at some level, and hence make me and them uncomfortable. It didn't seem worth it, even though I wouldn't have admitted that out loud. What happened instead, is that my sister approached her girls' dance teacher and asked if she would be open to having my girls in the Petites class (ages 3-5) with two of their cousins (Claire and Kate). The teacher, Ms. Darcy, was very open and encouraging. She changed the time of the class so we could attend, and enlisted the help of another cousin (Jenna) to help Eden. I was nervous going into it. It was something new, and I wasn't sure what to expect. Well, ultimately it turned out to be a very positive experience for all of us. The program was just right for us in that it was not too over the top. I had imagined a group of picture perfect little girls in tutus, in a perfect little studio dancing in front of a mirror with a bunch of stage moms there to put their child's hair back in place if their pony tail slipped or to fix their makeup if their lipstick was smudged. Not for us. Instead it was a community education based class, affordable, with kids from a variety of backgrounds. It was held in the cafeteria of a school that runs a Headstart program. It was low key and low pressure, but at the same time organized and very fun! A huge part of the reason the whole experience was so positive for us was Ms. Darcy. Darcy is young (in her mid-twenties), and clearly passionate about what she does. She teaches at the middle school level, in addition to teaching dance for several years. From the time we first met her she put my mind at ease. She was interested and completely willing to accommodate whatever needs Eden had..though it turned out she didn't need a whole lot. Eden just wanted to dance. Some people don't know how to interact with kids who have disabilities. Ms. Darcy was not that way. From the first day she "clicked" with the girls, and appeared very confident and capable when working physically with Eden. More than many people, she really seemed to treat her just like all of the other girls. She challenged her, praised her, and even reprimanded her on a couple of occasions:) I never once felt like she felt "put out" in any way by having us there and I appreciated that more than I can say. She loved and accepted the girls, and they loved her right back. There were many, many evenings that they requested that I *be* Ms. Darcy so we could pretend to be at dance class! Unfortunately the girls were sick, sick, sick in the days leading up to their recital. They were diagnosed with pneumonia on Tuesday and started antibiotics - the recital was on Saturday. We were just barely better *enough* to make it, and I fully admit to doctoring them up a bit so we could do it. I timed the breathing treatments, Motrin, meals, and naps so they would be feeling as well as possible and it worked out pretty well. There were a few technical difficulties with the lights and sound, and one of the little girls in Holland and Eden's class flat out refused to go out on stage. She was the only girl who wasn't their cousin, so it ended up being five little girls from my family:) Despite these little glitches, the girls managed to do a good job and entertained us all. They were ABSOLUTELY ADORABLE!!! They were the cutest kids in the show!!! Okay, okay. That might just be my opinion. But, I was very proud because they both went out there and did their best. Eden was a ham. She remembered a lot of her moves, and looked to the bigger girls when she wasn't sure what to do. She had a smile on her face the whole time and was very excited to be on stage. Holland was not as sure of herself. She stood in one spot and chewed on her fingernails until her cousins took her hands and dragged her along. At the end of the show, they were all supposed to march off the stage. Holland stood there like a statue until her cousin Jenna came back to get her. When Jenna picked her up, Holland wrapped her little body around her and gave a big smile to the audience. It was really adorable. And uncanny in the fact that John predicted to the tee how they would act on the stage! I am pretty sure we would have had the same reaction if they had been completely well. Eden is a ham, and Holland gets a little overwhelmed when she is the center of attention. No matter how you look at it...they danced. 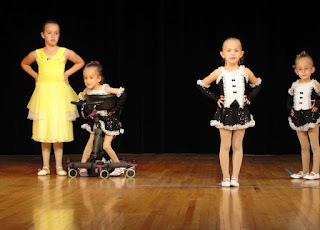 **On a more somber note, I cannot write a post about Holland and Eden's dance recital and not mention some recent tragic news. Just this past Sunday I got a call from my sister to inform me that Ms. Darcy was in a horrible car accident the night before. She has lost the ankle and foot on one of her legs. It looks like they will be able to save her other foot, although I am not sure it is out of the woods completely yet. I have been feeling very sad the past few days trying to absorb this news. There is so much in life that is so scary, unpredictable, and completely unfair. I don't even know what else to say. I told Holland and Eden about the accident today. Holland asked the question, "so she can't walk anymore?" And Eden chimed in, in the way that only she could do, and said excitedly, "Ms. Darcy can just use a wheelchair like MEEEE!" I told Eden that maybe she would...but just for a little while. Because I KNOW Ms. Darcy will walk again. I know she will dance again. Your girls are beyond adorable... I hope all your dreams for them, and those they make for themselves, come true. I'm so sorry to hear about Ms. Darcy. I will keep her in my thoughts. What a touching story! It's great to hear the girls are involved in dancing. 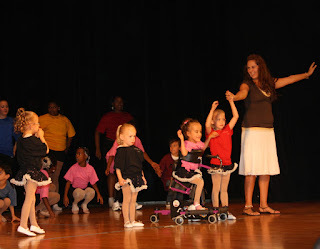 They are just too cute :) I'm also glad that Eden feels comfortable on stage and in class even with her disability. Holland and Eden look beautiful! It is so great to see them dancing together. Darcy will be in my thoughts and prayers. Eden is very wise ... there are many ways Ms. Darcy can dance again. Billie, you continue to amaze me. To be so aware of your own fears (boy, do I have my own! ), and to put them aside to do what is best for your girls. Just the thought of taking advantage of such opportunities can be paralyzing. I have always loved this song. It helped me tremendously after the death of my mother. I'm glad that it has brought strength to you and your girls. And I'm sure that it will bring strength to Ms. Darcy. Your girls are amazing and beautiful; this story and the pictures bring up so many emotions for me. We all need to dance! The girls, as always, adorable. And wise, in the way that children are. Will keep Ms. Darcy in my prayers, as the Lord brings her to my mind. She sounds like a delightful woman with many gifts that she generously shares. Well that was the happiest post that made me smile, up until Mrs. Darcy's accident. I hope that they all dance again soon!!!! Billie, what a beautiful post. I love seeing the pictures of the girls and hearing about such positive inclusion, the way it should be! easy and fun. thinking of Ms Darcy and I adore Edens comment, so true! I don't thin that anyone can make me cry with their words the same way you can. Miss Darcy, you are in my thoughts. i know that you will dance again no matter what. I'm totally crying. Sending light and love to Ms. Darcy. I'm so happy for Holland and Eden that they had such a positive experience with dance class, and such a lovely teacher. I hope this joy and love of music and movement will be a life-long source of happiness for both. And I'm SO sorry to hear about Ms. Darcy. She is in my thoughts and prayers. It's her turn to receive gifts of courage, hope, dignity, love and grace. They look gorgeous! 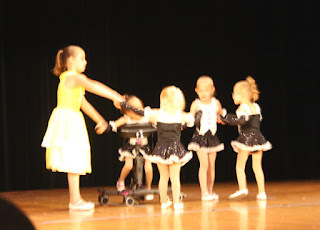 So glad the class and recital were such a sweet success, despite the obstacles. My heart definitely goes out to Ms. Darcy. Way to go, all of you. I know what you mean about the trepidation we feel about others not being able to deal with, let alone appreciate, our special kids. And i know how much we all strive to provide our little ones with a typical experience that is also one that is comfortable for them. You have done this for them, and looking at their pictures from the big recital brings a smile to my face. Sorry to hear about Ms. Darcy. Hope she recovers. You should never let fear get in the way of your dreams for your girls...they can and will do what you believe in them to be able to do and achieve. The story about their dance teacher brought tears to my eyes. Love Eden's positive response. Billie - What a wonderful post! And, Ms. Darcy - you are in our prayers. I hope that you, too, will Dance Again Soon. I hope you are surrounded by those who will love you & support you in this difficult time. Man, that made me teary-eyed like I didn't expect. You know, I told my son's PT about the girls and their dance class--trying to spread the word a little. I think it's simply fabulous and Eden looks like a born star! What a post! I cried all the way through it. I felt your emotion; it was so real. I know that Ms. Darcy is going through a tough time, what a blessing it was for her to have Eden in class. I know this experience will give her so much strength, hope, and perspective during her recovery and adjustment to her life after this tragic accident. Just when I thought I was finished crying over your post I read the last bit! I am glad I was not in the office while reading it. Your girls are amazing and Ms Darcy is amazing and the best of luck to her in her recovery. Stop by, we would love to have you in our community. Of course, your story would be a wonderful addition to our Preemie Journeys Pages. Email me if you would like to share. Before even reading the end of the post I had tears in my eyes. I can't say it enough - your girls are amazing. I just love hearing about all of the accomplishments they make every day. The bit about Ms. Darcy is just so heartbreaking. I don't pray but she will most certainly be in my thoughts. I work in the development department of a TV company based in London, and having come across your incredible blog, I would really like to get in contact with you regarding a potential documentary for Discovery. My email address is chloestrauss@septemberfilms.com - please do get in touch with me as soon as possible. This post really touched me. I hope Ms. Darcy dances again. I know that Holland and Eden can teach her to persevere. Ms. Darcy will be in my thoughts. I have been reading your blog from time to time. I work with kids with all kinds of special needs as a developmental specialist and music therapist in early intervention. I feel like one of the luckiest people in the world to work with children that amaze me every day. It's so sweet to hear your stories and the huge amount of love that you have for them. There are so many ways that these amazing kids can get shut out of things. It's nice to hear when they can "fit in". I had tears in my eyes from those pictures of your little one dancing with her stander. These are the images that the world should be inspired by, not celebrities. Kids like yours are the celebrities in my book. Keep up the truly wonderful job that you are clearly doing as their mom. They are so lucky to have you. I agree with the others--Eden and Holland are going to be an inspiration for Ms. Darcy. In their lives, your girls are going to run into things they cannot do the way others can. This will be one time when they can encourage and inspire someone else where some of their friends could not. They will have an insight their peers don't. That's a wonderful and important experience for them to have. I just wish it could happen without the injury to poor Ms. Darcy. She sounds like such a special person. My prayers are with Ms Darcy. I had tears in my eyes through the entire post and I know that your girls will keep on dancing and so will the wonderful Ms Darcy. Oh, wow. That was an incredibly well written post, and the last paragraph is so moving. I'll be keeping Ms. Darcy in my thoughts as well - I know that she *will* dance, even though it may be a long road to get there. Congratulations to your beautiful dancers (and to you!). And thinking good thoughts for Ms. Darcy and the dances that are in her future. I hope her many brave dancers can now help her and comfort her like she helped them. Absolutely precious photos. Both girls look so beautiful dancing. I'm so sorry to hear about Ms. Darcy... she's in my thoughts. You are such a great mommy! I love how you are showing them all they can be and do~!!! Awesome. I am so sorry to hear about Ms. Darcy. My thoughts and prayers are with her. There is a reason that your daughter met Ms. Darcy....and I think it will help both of them! How is Ms. Darcy doing? I hope she is doing well health wise. I am glad that your girls had such a positive dance teacher in their lives. Of course, I had tears in my eyes during the whole post, but hated the ending. I am so sorry for Darcy. I hope she is doing well, both physically and spiritually. What a powerful role model and mentor for your beautiful little girls. I am so proud of the girls for dancing! Wow. Miss Darcy's response is truly inspiring as is your blog Billie. Miss Darcy your spirit just jumped through my screen and will make me think twice about my ability to conquer issues in my life. To Holland and Eden - Keep dancing! You are so cute. OMG Billie, I am in tears!!!!!!!!! I have chills and my heart is just SOOOO happy for Holland and Eden!!!!!! What a wonderful thing....to dance. And what a fantastic teacher that they must have!!!!!!!! We need MANY more people in the world like her. Hugs to you all. How Beautiful. Please consider sharing your story on the Miracle Bebe website. We really enjoy having other parents put together a story and photos and we put them on their own page for other preemie parents to read. Your story is inspiring. Take a look at the other stories online and email me personally if you would like to be a part of our community. When you say she lost her legs, do you mean literally or that they broke? Either way I hope she feels better! My understanding is that her foot and ankle on one leg was crushed beyond repair and had to be amputated. The other foot suffered a lot of damage as well, but after a few surgeries that foot is healing with several pins holding it together. thank you for explaining. It's strange how someone you don't know can have such an impact on you. I genuinely was curious and concerned. That's so awful, especially since she was/is a dancer. I love Eden's initial though. Children are so amazing and innately optimistic as well as resilient. Miss. Darcy taught your girls so much, I hope she can take their spirit and optimism as a lesson from them to her! I feel just awful for her and the fact that she is/was a dancer is even more tragic! It's amazing how people we do not even know can touch us. Eden's attitude towards the situation is just precious! I wish I had that innate optimisim. I love how Eden is so comfortable in her own skin (which is remarkable for anyone, let alone a child who is 'different'). Thanks for sharing your story with us here! Great post, Billie. I'm crying for poor Miss Darcy, but with friends like your family, she is blessed. I love your blog. I am a fellow preemie mom...my son was born at 28 weeks 5 days. I have to tell you many times when I thought my life was tough i came and read your blog and knew I could do it too. I love that your girls are so perfect in their own ways and I love even more that Ms. Darcy helped this dance dream happen. This entry literally brought me to tears. This is Miss Darcy's brother, Jeff. I'm with her now in the rehab hospital and she said I could post an update. She has been in great spirits since the beginning, though sometimes in a bit of pain, and is ready to go home. I'm very happy to say she's going home later today. They told her when she got here if she worked hard she could leave in a week. If you know her you know how determined she can be when she has a goal to meet. The word stubborn comes to mind. It will take time but she will be walking again as soon as she can. She’s just happy to be going home. For those who asked, her right leg above the ankle was nearly severed at the scene and was removed at the hospital. Her left leg was severely injured but they set the bone that night and later pinned it. Two weeks ago they covered the wound around her calf with skin grafts. Last week they moved her here to learn how to get around and take care of herself, which she’s doing quite well. She does have a cool wheelchair now and I hope she lets me help accessorize it but I’m not sure she will. I tend to go overboard. We talked about her future plans and how she can continue to accomplish them. She has been thinking positively from the start which is why her spirits are so high. We also talked about the twins. She spoke highly of them and how hard they worked and how proud she was of them. She mentioned how their mother didn’t think anyone would teach them to dance but that’s my sister. My kids were in the recital, too, and I saw the show. The twin’s number brought the house down. Now she has a few hurdles ahead of her but, like the twins, something’s only an obstacle if you don’t try to overcome it and allow it to stop you. And like the girls she will show you can do anything if you try. She'll start proving that when she goes home today. My family thanks you all for your prayers and well wishes and I hope we will see you all at the next recital. I have no doubts they will all dance again. God has a plan! This is just a few glimpses of the future.